Smart Protection - Protection that changes as your ambient sound environment changes. Electronic ear plugs can "listen" to the sounds around you, provide automatic protection from sudden impact noises (such as gunshots or cymbal crashes), or even slowly turn up a lower NRR of protection in response to background noise gradually increasing to a hazardous level. Electronic ear plugs help you get exactly the protection you need from one moment to the next, without you ever needing to remove or fiddle with your ear plugs. Hearing Clarity and Amplification - Hear better while wearing ear plugs! 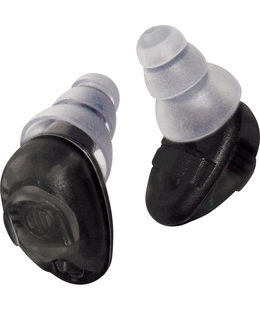 Our electronic ear plugs all provide two modes for enhanced auditory perception. Natural hearing mode allows the user to hear what's going on around her just as if she were not wearing ear plugs at all (until a dangerous sound occurs). Amplification mode actually makes safe sounds such as voices, game sound, your range instructor's commands, or bird song from that tree across the field louder, playing the amplified sounds through tiny speakers in your ears. The smart hearing protection only kicks in to block noise when it's needed. Electronic ear plugs are a superior choice for any situation in which you need hearing protection AND situational awareness (the ability to hear what's going on around you, critical when using firearms or working around heavy machinery!). Electronic plugs are excellent for hunters and shooters in the range or out in the field, for music educators and musicians of all ages, and for industrial workers both on the factory floor and operating heavy machinery. The excellent situational awareness these plugs provide, combined with their smart hearing protection, make electronic ear plugs some of the best hearing all-around safety equipment available today. These innovative ear plugs for musicians "listen" to your auditory environment and adjust the amount of hearing protection you receive from moment to moment automatically, allowing you to protect your ears from hazardous noises without diminishing your ability to clearly hear the rest of the music. Although we do not sell medical hearing aids, a number of the products we sell call for treatment as if they were regular hearing aids. Accordingly, we carry a number of hearing aid accessories to keep your in-ear devices clean and dry between uses.